KPC Leisure Limited was established in 2013. Based in Wimborne Minster, Dorset, the company specialises in pre-owned, quality motorhomes and campervans. 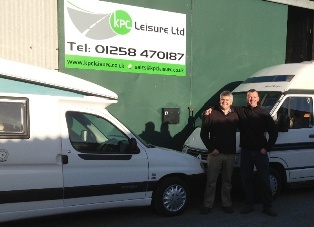 Directors Kris Meehan and Paul Limb collectively have over 30 years experience in the industry, both worked for a national retailer before setting up KPC Leisure. Kris and Paul pride themselves on offering great value, excellent customer service and an honest approach to leisure vehicle ownership. Their extensive experience and knowledge of motorhomes, campers and caravans enables them to give detailed guidance, and match customers to those vehicles which most suit their needs. We value our customer's feedback, and some of the wonderful comments people have left with us are shown below - thank-you! "Trustworthy place to buy your dream motor home"
"Delighted with the van, best I have had to drive ,she's a real corker"
"Thank you to both of you for the whole experience of purchasing Olga (short for Old Girl) and for making sure the transaction was trouble free, we've only used her a couple of times but she's touched our hearts already"